Miami Heat guard Dwyane Wade scores against the Houston Rockets. 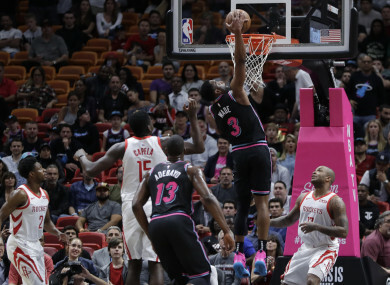 THE MIAMI HEAT snapped Houston’s five-game NBA winning streak with a 101-99 victory on Thursday in a game that saw Rockets point guard Chris Paul injured again. The Rockets, coming off an 18-point victory over Washington on Wednesday in which they set a single-game record with 26 three-pointers, were leading 45-37 in the second quarter when Paul, diving to regain control of the ball, clutched his left thigh and quickly left the game. The Rockets said Paul had a left hamstring strain and wouldn’t return. “It’ll be some time,” Rockets coach Mike D’Antoni said of Paul, who is scheduled for an MRI exam on Friday. The defeat and injury were a double-blow for a Rockets team that had looked to be turning the corner after a slow start to the season. With five straight wins they had risen from 14th to seventh in the Western Conference in the space of a week. But the loss of Paul could prove particularly damaging. They lost games six and seven of the Western Conference finals last season after Paul suffered a right hamstring injury. Josh Richardson led the Heat with 22 points. Tyler Johnson added 19 — producing a layup, a big block and a three-pointer to pull the Rockets to a 96-92 lead with less than three minutes remaining. James Harden led the Rockets with 35 points, 12 assists and six rebounds, climbing off the floor after a frightening fall midway through the fourth quarter to make two free throws that pulled Houston into a 90-89 lead. But the Rockets couldn’t hang on. Miami star Dwyane Wade missed jump shots on the Heat’s last possession and Houston’s Gerald Green corralled a rebound. Eric Gordon inbounded to Harden, who passed back to Gordon whose bid for a game-winning three-pointer at the buzzer bounced off the rim. In Los Angeles, the Clippers piled more road misery on the Dallas Mavericks with a 125-121 victory, snapping a four-game losing streak. Forward Danilo Gallinari led the Clippers with 32 points. Lou Williams added 26 off the bench as the Clippers withstood 32 points from Mavs rookie Luka Doncic. Dallas center DeAndre Jordan, who played 10 seasons for the Clippers, scored 11 points and pulled down 10 rebounds in his first game at Staples Center against his former team. The Mavs trailed 89-82 heading into the final period but reeled off eight straight points to seize the lead. That was the first of six lead changes in the final 10 minutes. For the Mavs it was a fourth straight defeat, three of those coming on the road. Dallas, who have won just twice on the road this season, continue their current road trip with games against two-time defending champions Golden State and Portland on Saturday and Sunday. Email “Miami snap Houston's five-game winning streak while LA Clippers edge out Mavericks ”. Feedback on “Miami snap Houston's five-game winning streak while LA Clippers edge out Mavericks ”.